There are lots of who talks about to start a blog, but not just starting but developing a blog requires lots of efforts. Many businesses looking for bloggers to write articles to start a blog for promotions & marketing. Without blogging there is no meaning of SEO, and in business blogging the Content Writing is must to promote all your products on social media. To generate inbound leads you must focus on writing effective blog posts with engaging contents to put those valuable call-to-actions that will able to drive leads and customers. Your blog is one of your most important marketing tools for running your business. 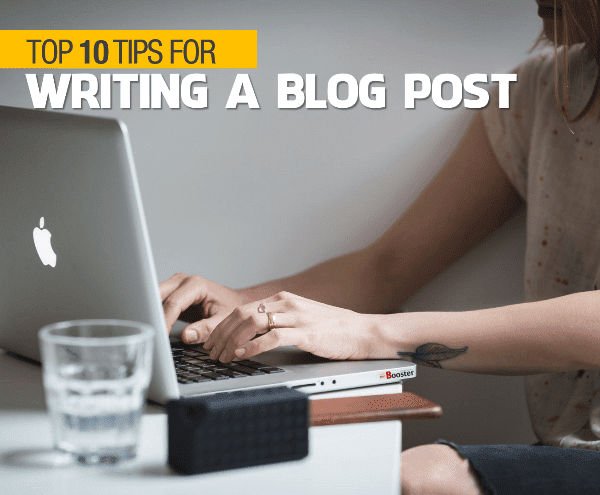 Today, in this article, I'm providing you best blogging tips on how to write a blog post effectively in ten simple steps that people will really want to read. There are lots of techniques on how you can write your blog content, and the purpose of the method provided here is that it allows and encourages you to be as original & creative as you prefer. Experts follow these guidelines to write an engaging & bookmarkable blog pages and that helps to build the trust with your readers, educate customers, generating inbound leads and for better branding. Going to share a new perspective that’s will work to help you very well as a writer, independent of your niche. Let's check out how to write like a pro. And today I want to share with you some but most important tips that will help you quickly write down your blog pages like a pro and help you get more readers to build your blog successfully. It’s usually challenging to consistently write helpful and engaging content. 1. Consider a structure for your blog posts. You may have more success if you create consistently formatted and/or structured blog posts. A recent study by a writing service showed that having a blog structure not only helped maintain blog traffic numbers, it also helped the writer generate more consistent content. The structure you generate can be anything you like. For example, some people only write paragraphs of five sentences and then put a joke at the end of each one. Some people set their blog posts out with the same headers every time, and others like to mix their message with text and images. 2. Use your own voice and make your own point. We have entered a stage in human history, where people are afraid to put something funny onto social media because it will invariably offend somebody who takes offense on behalf of other groups. Yet, some bloggers (and the president of the US) are doing quite well by ignoring it. Popular bloggers are not fighting PC thugs, they are simply ignoring them. If they want to say that many poor people adopt a “victim” stance, then they do and they will. They are not saying it to be shocking, they are simply ignoring the many, many, many rules that PC thugs are trying to inflict on the general public. 3. Do not take tips from online tools. People use apps such as the Hemmingway app and proofreading apps, and they completely ruin their blog posts. These tools were designed to sap every molecule of creativity and originality out of your text until it reads like your granny’s grocery list. 4. Stay within the same or similar topic or subject area. Later in this article, you are going to read a tip that says you shouldn't let online advice limit you in any way. This is the only tip on this article that attempts to limit you. Try to stay on the same topic or subject area. Do not go from game reviewer to environmental activist to stand-up comedian each week because your readers will have a hard time supporting you. 5. Switch from 1st, 2nd and 3rd person as much as you wish. Many online articles tell you that you cannot switch in this manner, but why not? Maybe your text will look a little more confusing, and if you do it too often then it will look schizophrenic, but who cares, it is your blog, your baby, and your playpen, do what you wish. 6. Use a scheduling tool and write in batches. Take advantage of the times you are in the zone by writing as many blog posts as you have the energy for. Then, put them into your scheduling tool and schedule them for weeks and months ahead. That way, you do not have to write blog posts for the next few weeks. 7. Get as schwifty as you like. Use as many obscure and esoteric references as you like. Popular TV shows (Simpsons, Family Guy, South Park) have made a living from it. The Simpsons have stolen the storyline of almost every classic movie. Family Guy without Star Wars references would be like strawberry jam without chunky bits, and South Park without references to celebrities would be like a day at the beach with no sun. It is true that a large portion of your readers will not be able to get as Schwifty as you would like, but the ones who do get Schwifty will be thrilled at your reference. The ones that don't get it the joke/reference will forget it and move on very quickly with no harm done. 8. If it is boring, then don’t do it. It is your blog, it is your baby, and it is your hobby. With that in mind, stop writing things that you do not want to write about. You “do not owe” it to your readers. Even if your readers are asking you to cover a certain topic, don't do it if it is boring. What is the point in being a blogger if you are forcing yourself to do boring tasks? You can do boring tasks at work and get paid for it. 9. Proofread them another day. Long-term bloggers who have been at it for a few years will often admit that proofreading is the most boring part of the blogging process. With that in mind, read through and proofread your blog post tomorrow instead of just after you have written it. If you proofread it today, you will probably skim over most of it anyway because you know what you wrote and your brain anticipates the next sentence. Read through it tomorrow and not only will you become a better proofreader, but the text itself will be slightly more interesting than it was yesterday. 10. Stop taking any advice that limits you. There is loads of poor advice online, and why shouldn't there be. Think about it, if you walked into a room and asked everybody for advice on a subject, most people are going to give you poor advice. No matter which pieces of advice you follow, try your best to avoid advice that limits you in any way. If advice says you shouldn't use figures to back up your points without correctly sourcing them, then ignore them because 98.5% of the time they are wrong. If they say you shouldn't spell things incorrectly on purpose, den screw dat. Advice that limits your creativity is probably bad advice.